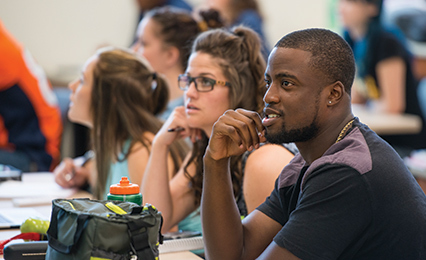 Sound assessment processes and high academic standards are vital components of maintaining and enhancing the quality of learning at Colorado State University-Pueblo. The Provost's office is committed to promoting faculty, staff, and student understanding of and engagement in academic program assessment. We are focusing on integrating assessment throughout our campus by continuously examining our effectiveness and making changes to improve. Assessment is a key requirement for our continued accreditation with the Higher Learning Commission. And, for the professional programs, assessment plays a significant role in initial accreditation and re-accreditation. While these are important reasons for strengthening the assessment process, the benefits go far beyond meeting accreditation standards. Authentic assessment is about academic program improvement. It allows our campus to document the quality and success of its academic programs and identify new opportunities for growth and development. It provides the systematically acquired information academic programs need to identify areas and issues that must be addressed to provide the quality educational opportunities that our students need to be successful in their careers or educational pursuits. Academic program assessment is owned and driven by faculty in their respective departments with support from the college or school and the institution. Faculty are responsible for assessing student learning and making appropriate changes to programs based on information provided by their assessment processes. The campus recognizes that there is no single best way to assess. While student learning outcomes and assessment techniques should be consistent with our campus mission and strategic plan, their evaluation should also lend itself to the discipline-specific techniques with which faculty are familiar. General education and its assessment are managed by the CSU-Pueblo General Education Board. The Board involves faculty from across campus to establish and refine student learning outcomes, assure that the curriculum provides opportunities for students to acquire them, evaluate artifacts of learning, and make changes where appropriate. The Institutional Effectiveness Committee is charged by the Provost with providing leadership for the overall direction and support of university and academic program effectiveness, assessment, and improvement. The IEC brings together faculty, students, and staff from across campus to identify areas where improvement might be initiated and then make recommendations for change. It acts as the primary body for centralizing and synthesizing assessment and effectiveness activities across campus. The Provost’s Office supports assessment efforts in a number of ways. Through the Assistant Provost for Assessment, Student Learning, and Effectiveness, regular communication and collaboration is established among the President’s Office, Finance and Administration, the schools and colleges, the University Library, Extended Studies, and Student Affairs. Institutional assessment such as surveys and management of the campus assessment reporting system is conducted through the Provost’s Office. While CSU-Pueblo values shared leadership and responsibility for assessment, the Provost’s Office assures that assessment activities are consistent with its mission statement and generally accepted standards for good practices.